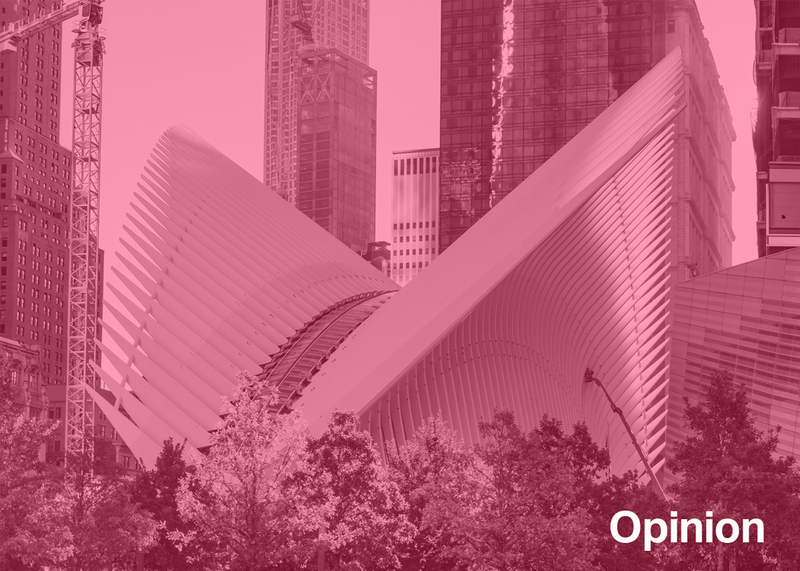 Opinion: Santiago Calatrava's World Trade Center transit hub may be Instagram-friendly, but it is part of a troubling trend for public spending on spaces that aren't really public at all, says Alan G Brake. On a recent Sunday afternoon children sprawled on the gleaming white marble floor beneath the oculus in Santiago Calatrava's new transit and retail hub at the World Trade Center site. Young couples Instagrammed the white ribbed ceiling with light streaming through a strip of skylights. People hung out and marvelled at the space, a photo-worthy hall that at this moment serves no purpose at all. It was a rare moment in an un-programmed, un-planned, free space in a relentlessly commercial city increasingly defined by exclusion and surveillance. Though on that day the hall resembled a public space, few will mistake it for one in the future. Referred to as the transit hub, Calatrava's largely underground building is, in fact, a vast shopping mall that happens to connect to a few commuter rail and subway lines. The signature oculus is actually an atrium that brings natural light — dramatically, even beautifully – into a two-storey shopping arcade that rings the space. Early on, Calatrava hoped this space would bring light down to the train platforms running under the site. In the reality, the oculus serves as a magnet to pull in throngs of tourists from the plaza level below ground. Above ground, the all-white structure is dwarfed by the towers that surround it, including SOM's One World Trade, Rogers Stirk Harbour's Three World Trade, currently under construction, and Fumihiko Maki's tower Four. BIG's (or possibly Foster's) tower Two, for now, exists only on the boards. Calatrava gave his small peaked building greater presence with asymmetrical tines that crisscross over the skylights. The relatively small number of riders exiting the platforms half a city block underground from the oculus/shopping atrium, which the Port Authority claims to be about 50,000 per day, are not enough to support all the retail space eventually planned for the site: 34,800 square metres. Revealingly, the Port Authority, the bi-state agency that built the complex, refers to the oculus at the Transportation & Retail Hub on its website for potential tenants. This is where Calatrava's architectural theatrics do their real work. The thousands of New Jersey commuters are easily matched by the throngs of visitors milling around above ground who are there to see the 9/11 memorial and the country's tallest building, One World Trade. So Calatrava's task is to draw as many of those people down to the shopping concourses below as possible, converting tourists into consumers. It is a creepy feeling to realise that Calatrava's relentlessly uplifting, glaringly white mall sits in the same concrete bathtub as the 9/11 Memorial Museum, separated by a wall. In the grim and grey museum — an appropriately sombre vessel designed by the New York firm Davis Brody Bond — the events of the attack are remembered and recreated everyday during business hours. The victims are permanently memorialised, and the specifics of the events and some of their lasting impacts are inscribed in the public memory through multimedia installations and moving artefacts. The space also entombs unidentified human remains. Never forget. In comparison, the mall feels utterly scrubbed of memory and dislocated from time and place. Calatrava's rather limited architectural language of skeletal structure, sea urchin-like forms, and his all white palette is so well-known, so global, so tied to his personal brand. The oculus is only a small piece of his complex, which extends three and a half city blocks underground via storefront lined concourses to another ultra-luxury mall and food court to the west and another retail-filled transit hub, the Grimshaw-designed Fulton Center, to the east. Construction fences still surround Calatrava's building at plaza level, so in order to see the interior of the oculus, visitors must navigate a confusing route of paths and corridors through the temporary station to reach it. But when all the barricades and construction fences finally come down, it will be possible to cross about two thirds of Lower Manhattan through underground, privatised, highly surveilled passageways. Large portions of the overall site loudly celebrate and commemorate freedom, yet in many its spaces freedoms are limited and policed. As one moves the blocks and blocks underground from west to east, one travels across a kind of gradient of publicness and luxury. In the very high-end mall along the Hudson River one encounters wealth on gaudy, almost joyous display. Cesar Pelli's Postmodern Winter Garden has been updated and rechristened Brookfield Place, its glittery brands — Burberry, Gucci, Hermés, Michael Kors, among others — supplemented with a high-end food court of miniature versions of fashionable New York restaurants and a French-themed food hall. It is clearly a private space, targeting wealthy shoppers and the financial and media workers in the surrounding towers. After all the brass and marble at Brookfield Place, Calatrava's all-white world is a bit of a palate cleanser, albeit a temporary one – all the storefronts are still empty, so signage and commerce will eventually disrupt, or relieve, the purity of the space. Grimshaw's Fulton Center to the east, which accommodates 11 subway lines serving approximately 300,000 people per day, predominantly New Yorkers on their way from home or work, is largely metal and glass. Though it too has a private retail operator, Westfield, it feels tough and durable and more rooted in the daily life of the city. And though it also has a frequently Instagrammed oculus, with a James Carpenter-designed Sky-reflector Net, this actually brings light into the centre itself. The $4.4-billion (£3 billion) sticker price of Calatrava's mall has provoked widespread consternation, and given the city's crumbling infrastructure, the number is even more appalling. Calatrava, who has a checkered history of budget-busting projects, several of which have elicited legal action, is an easy target for both anti-government misers and anti-design curmudgeons. Still, it is worth asking if the Port Authority should really be in the business of building high-end shopping malls when the city, and the larger region, struggles with outmoded and over-capacity transportation infrastructure. Some have argued that the public will come to treasure the World Trade Center hub as it does Grand Central Terminal, the city's most iconic temple of transport. It is an unfortunate comparison. At Grand Central, dozens of commuter tracks from Upstate New York and Connecticut converge and connect to the city's busiest subway lines. Travellers pass through a monumental Beaux Arts hall on their way to purchase tickets, check track locations, and board trains. It's both beautiful and useful. Yes, there is shopping and dining at Grand Central, much of it high end, but it is largely confined to the periphery. The largest, most generous, and most central space is a civic gift. Calatrava's extravagantly expensive mall may be beautiful, but it is a place to go to avoid New York rather than to experience it.